ACTIVE is a platform for constructing service-oriented applications which can be accessed through multiple modalities in a natural, task-oriented manner that leverages context throughout the experience. New services (or content sources) and new types of services can be added dynamically, and through automatic service composition, users not only have better access to individual services, but also to the collective power of the parts  individually designed services seamlessly work together on behalf of the user. 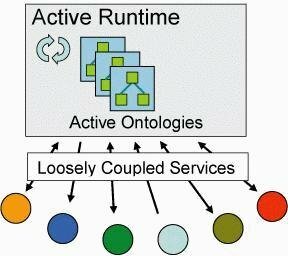 ACTIVE uses a novel active ontology approach to modeling and implementing applications. Ontology: A formal representation for domain knowledge, with distinct classes, attributes, and relations among classes; a data structure. Active Ontology: A processing formalism where distinct processing elements are arranged according to ontology notions; an execution environment.